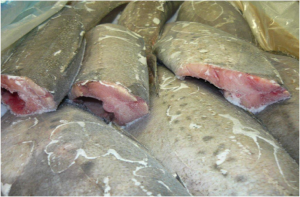 Silver Warehou (Seriolella punctata) | Wildfish Export Ltd. Description: Blue-grey above and silvery-white below with a dark head that extends towards the dorsal fin. Silver Warehou have a dark blotch above the pectoral fin and blackish spots on the mid belly. They differ from other Warehou species with their slender shape and pitted skin. Fishery: Silver Warehou are members of the Centrolophidae family (butterfishes, medusafishes). They live off the shelf edge and the upper slope at 200 to 500 metres. The major concentrations are found off both coasts of the South Island (extending south to the Auckland Islands) and on the Chatham Rise. Silver Warehou populations are managed sustainably under New Zealand’s fisheries quota management system. Meat Quality: Silver Warehou has a white, firm texture. Silver warehou has high fat content. Suited to all methods of cooking.